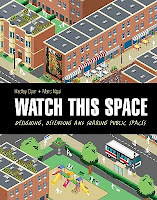 Watch This Space: Designing, Defending, and Sharing Public Spaces by Hadley Dyer and Marc Ngui. (Grades 6-10.) Kids Can Press, March 2010. Review copy provided by publisher. Where do the teens hang out? Where did you hang out when you were a teen? Teens need public spaces. They need places where they can hang out with friends, where they can see and be seen. But how are public places and private establishments different? Who owns them? Who can advertise there? Is a mall a public place? Is a restaurant? How about a public school? 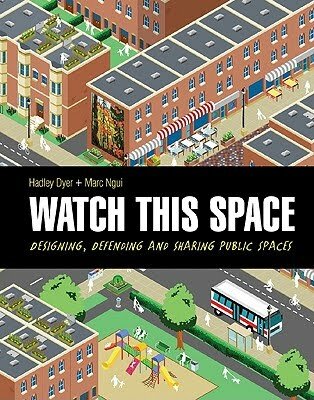 In Watch This Space, Hadley Dyer examines different public spaces around the world and the features that make them successful. How are urban public spaces different from suburban public spaces? How does public space affect a community? And who's allowed in the public space? There is a lot of information packed inside this relatively small book, but it never overwhelms. Rather, Dyer gives brief overviews of many of the issues affecting public spaces and their use and design. For example, Dyer describes laws in different countries that govern public spaces. Did you know that it's illegal to bring gum into Singapore because of their strict anti-litter laws? Or that "in the United Kingdom, the average person is recorded on... surveillance cameras more than 300 times per day?" Where are the boundaries between personal freedoms and the responsibility to create a space that's pleasant for all? She also talks about the barrage of advertising that we see every day, in the community and in our virtual public spaces. Other topics covered are public art, transportation, and the different between urban and suburban public spaces (among many other things). Watch This Space is definitely a book that could spark a lot of discussion if presented in the right way. It'll give teens a lot to think about and it may have them viewing their public space options in a whole new way. Especially useful are the tips about how teens can get involved with public spaces in their communities. From joining (or starting) a library teen advisory board to taking control of advertising in school by promoting a no-logo day to hosting a fundraiser, these tips will give action-minded teens some great ideas. I don't know that this is a book teens will seek out on their own, but I think that if they can be coaxed to open it up they'll find accessible and interesting information. This might be an especially useful title in a library or school planning to create or upgrade teen space or in a community with plans (or with no plans) to develop a teen or community center. Read more reviews at BookDragon, Jean Little Library, and A Chair, A Fireplace & A Tea Cozy. Happy Nonfiction Monday! Check out the roundup over at Lerner Books Blog.